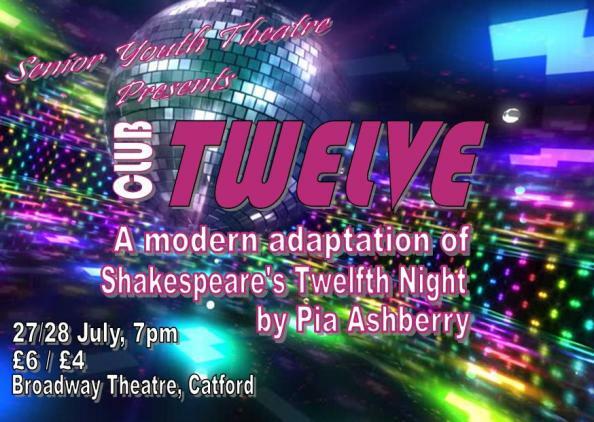 Lewisham Youth Theatre-” Club 12″ A performance of Shakespeare’s 12th Night. Great Atmosphere. Great Music. Food of Love, Innit? Originally written and produced with LYT’s Senior Youth Theatre in 2003, we’ve updated Pia Ashberry’s hilarious modern-day take on Shakespeare’s classic for a new generation. Over 50 young people are involved in the 2018 Senior Youth Theatre production as performers and backstage crew. Find out more about the production here. LYT’s free youth theatre and technical theatre projects are supported by multiple funders, including Lewisham Council, BBC Children in Need, The Henry Smith Charity, William Wates Memorial Trust and Garfield Weston Foundation.